The older generation can discount the digital world all they like, but they cannot deny that checking your bank account balance naked in the middle of the night was a much more stressful activity in the good old days. Do they have coffee breaks in a tea factory? 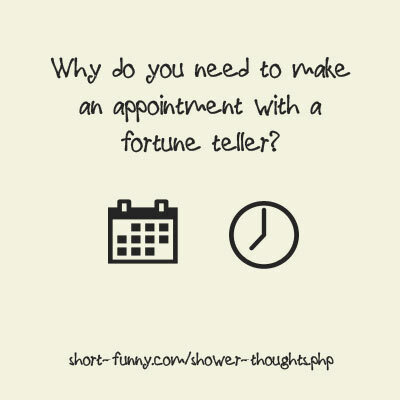 Why do you need to make an appointment with a fortune teller? They sell a face cream that promises to take 20 years off of you. Is that life-threatening for a 19-year-old? Why do I have to click Start in Windows when I’m trying to shut down the computer? If a toy from the Toy Story died, the children wouldn't really be aware of that and all the other toys would be forced to witness the children playing with their friend's corpse. Light switches also work as dark switches. Do truck drivers have a glare fight during the 10 minutes that one spends overtaking the other? Your belly button is your old mouth. What if stones are just super nervous organisms and only get all tense when we touch them?